Today I have an update on using the Colour Factor set. 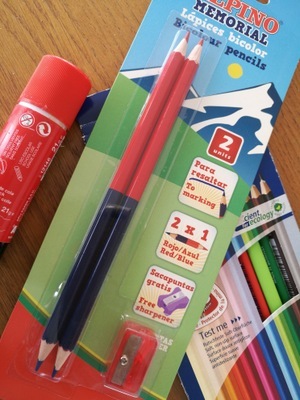 For the rundown on how this maths teaching tool helps kids visualise numbers as something concrete and dynamic, have a look at my earlier post on these coloured rods. 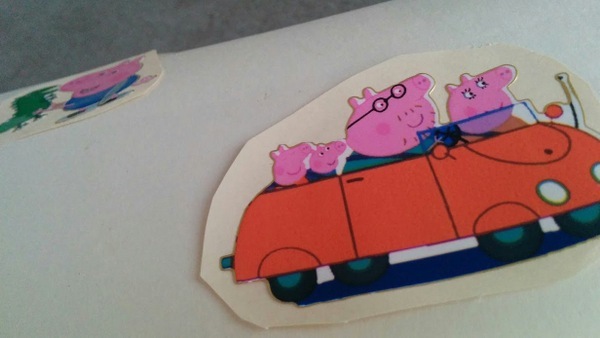 My daughter’s teacher at the local Spanish school has used them for learning addition and subtraction. But their wonder, for me, lies in how far you can take maths using them with even fairly young children. 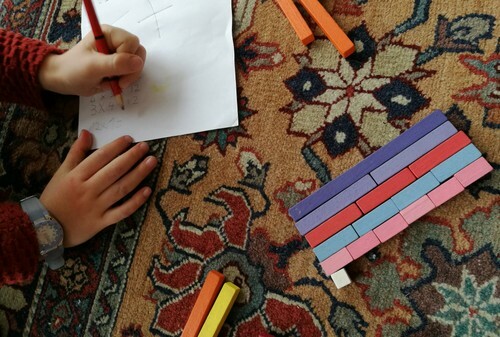 The author Máire Mullarney talks about overhearing her two boys aged around five and seven discussing whether or not 17 was a prime number, and when you actually play with the blocks, you can see how that would be possible, without your kids having to be child prodigies! This prompted her to ask why some were similar colours. I decided to do the odd “stairs” and even “stairs” with her. I checked first that she already had a clear idea of odd and even numbers. She understood them as sequences of alternate numbers and also that evens were multiples of two. In other words, in colour factor terms, you can’t make a row of pink twos the same length as an odd number. 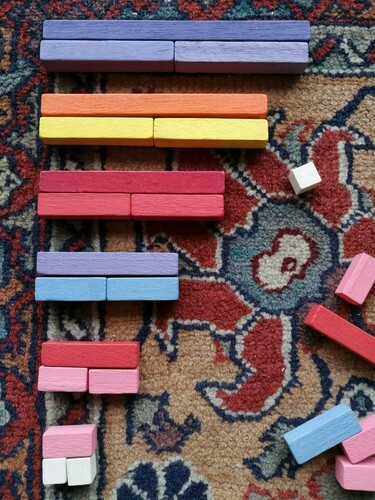 To show the relationship of even numbers to each other, which is the role of the warm reddish colours, we grouped the even number blocks as stairs, noting that the difference in length of adjacent rods is equivalent to two, not one as in the full set of stairs, and noting the colours. Then I asked her to match the length of various even rods using a row of rods of a different colour. Seaton Pollock called these single-colour rows “trains”. This shows tangibly the role of factors because of their physical size, and the colours underline the message. Next we set about laying out the factors of twelve. We began with a mauve rod representing twelve, alongside two sixes. 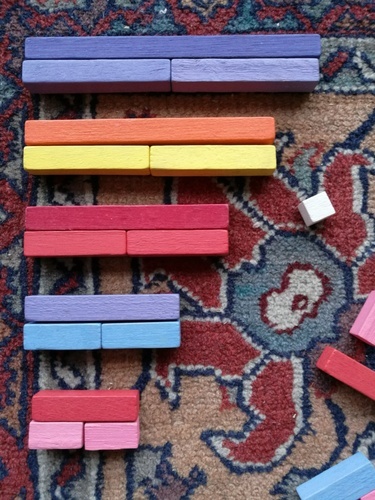 I asked her to add another single-colour row which would be the same length and she chose six pink rods, or twos. Next she added four threes. Then I introduced the word “factor”. It clicked that the factors are represented by colours, hence the name Colour Factor Set! 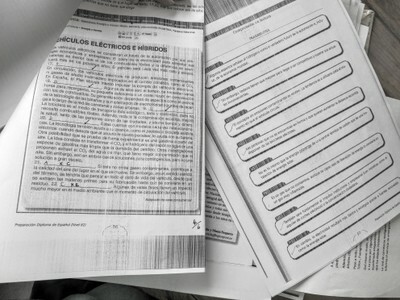 I can honestly say I would never have dreamt of discussing factors with a five year old just using pen and paper. But with the rods it comes easily. Most of colour factor is about learning on the basis of what is physically visible in the blocks, which is why it works so well with little kids. However, since she has already done quite a lot of simple sums on paper at school I was ready to bring in a written format. I wrote out the following to show both ways of presenting the facts: 6 + 6 = 12 2 x 6 = 12 She digested that. Then I wrote out the “trains” we had before us in the order we had made them: 1 x 12 = 12 2 x 6 = 12 6 x 2 = 12 4 x 3 = 12. Then I asked if she wanted to know a trick to find yet another factor, and we discussed how 2 x 6 (two violets) came to the same as 6 x 2 (six pinks). This made immediate sense to her. 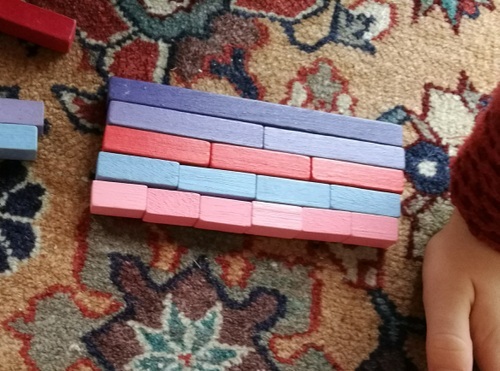 She quickly realised that above the row of four light blue rods (4 x 3) she could make a train showing 3 x 4 with the scarlet blocks, and finally a row of twelve whites (12 x 1 = 12). Then she decided to write these on paper herself, adding to our list with a triumphant flourish. You can get a secondhand copy of Máire Mullarney’s book Anything School Can Do, You Can Do Better for a song off Amazon, and Colour Factor Sets come up on eBay from time to time. Don’t worry if a few of the smaller blocks are missing from these vintage pieces, the set will still be perfectly usable. 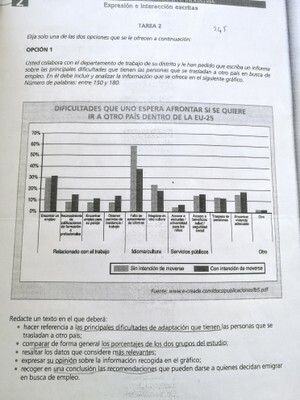 I last wrote about the DELE Spanish exams, which surprisingly I passed, and I’ll have more on that some other time. 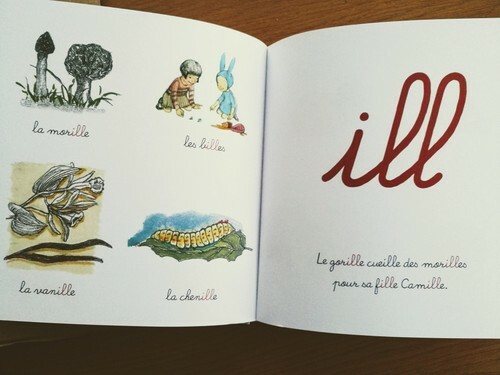 But today I want to talk about a lovely book for teaching your kid to read French. 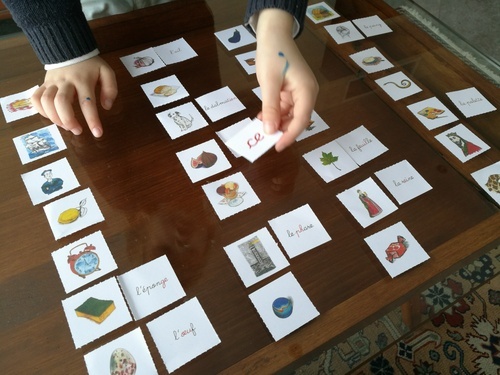 This has been just the thing for helping my five-year old learn to read in French, but I can imagine it being useful also for older kids who are not native speakers. I’ve included photos so you can judge the level for yourself. Kids are sponges, but that works both ways. Easy in, easy out. Growing up with several languages may sound exotic, but the reality is you have to strike a balance. Sure kids CAN learn anything and everything, but there’s only so much time in the week. And like adults they will conveniently forget what they don’t use. I’m also not a fan of high-powered schedules for kids. I’m just not willing to sacrifice a lot of family time and farm them out to afterschool classes all week long just to make them trilingual. There’s never time for everything, so you need to decide what is important and what level you want to achieve in each. I like to think I’ll see my kids speaking, reading and writing in English, French and Spanish with a good level of proficiency, and having an affinity with Arabic (spoken and written) even if they don’t learn to speak or read it as kids. I think we have enough language resources (ie relatives, friends, circumstances, travel and access to books!) to manage this, but of course life does throw surprises at you. I think we have English nailed since I’m their main caregiver, and incurably pedagogical at that. Plus English will always hold its appeal when they are in their teens and wanting to watch blockbusters and other weapons of globalisation. And my daughter is already picking up Charlie and the Chocolate Factory to read to herself. So that’s English taken care of. As for Spanish, my little Beiruti is already in her second year at the local school, and my Paris baby starts in September. 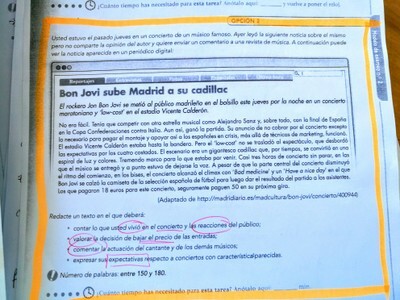 They’ll get ample practice at reading, writing and, of course, chatting in Spanish. French on the other hand risks falling behind. We already make sure they get plenty of stories and some one-on-one with dad. We haven’t ruled out returning to France at some point such as during secondary school. 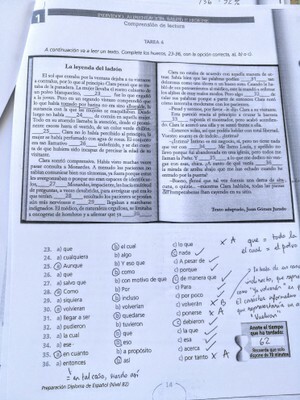 But how to crack reading in French? Dad is at work all day and French is as hard to decipher as Spanish is easy. The orthographic depth of French is, well, deep. I found this out when I taught her to read. We began with easy three letter words which are read just as they are written, with no silent letters. 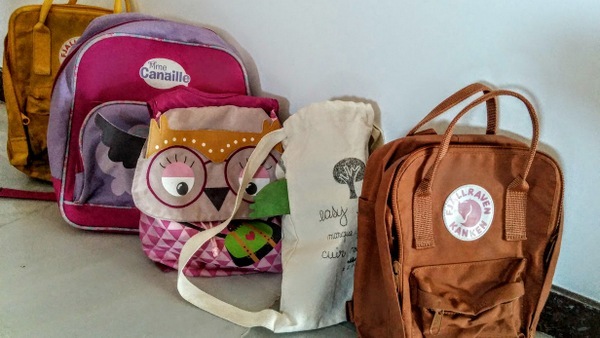 That meant tonnes of household objects and animals in English, but scarcely a handful in French. 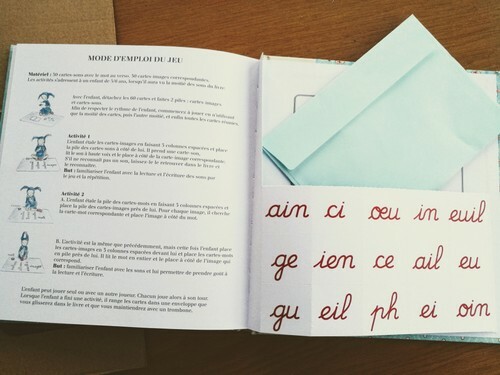 Each page takes a grouping of letters which produces a certain sound. The example words are beautifully illustrated. Most of the words are simple, others are less common. Some of the sentences are frankly hilarious. And at the end 30 little sound cards with the relevant word on the back to match with picture cards. Result: my five and a half year old is suddenly reading pages of the P’tites Poules collection of stories, which Amazon has down as being from 6 years and up. To see her so engrossed in a book, actually reading silently to herself, is just a treat. 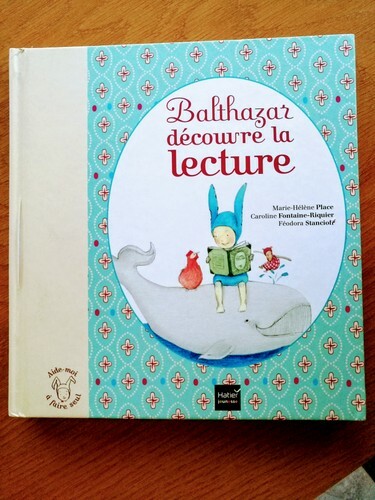 I see Balthazar also has a range of first readers for little ones. They are in cursive, which could be difficult if your kids are in an English or US school, which either doesn’t bother with cursive or teaches it much later. The Spanish feel as strongly about it as the French do and teach it from five years old, and kids are doing loopy b’s and z’s before they can write much more than their name. 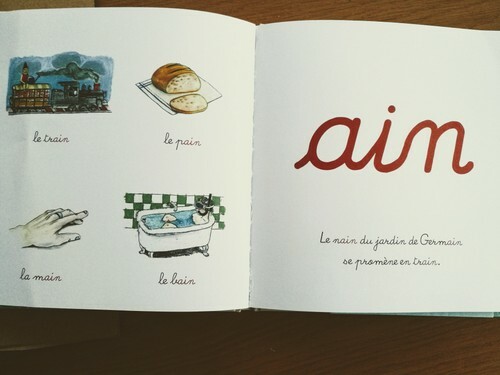 However, in these books apparently the silent letters are in grey so kids can read the words and get used to the spelling, which sounds like a smart approach to French for novice readers.